Merry Christmas to one and all! Our next service will be a celebration of Epiphany on 5th January 2013! May you and those you love have a blessed and happy Christmas. This Sunday will see our last service before Christmas, and we will be celebrating the birth of Jesus and all that his coming means for the world. Next Monday I travel to the UK where I will be spending Christmas with my family. I will miss many of you over the holiday season. Our Services will recommence on Sunday 5th January when we will celebrate the Feast of Epiphany. During the break, you may wish to join the Seven Fountains Retreat Center services. 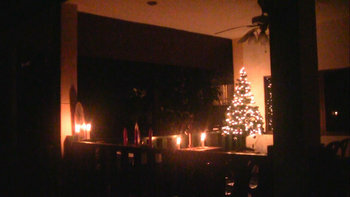 They have worship in English on Christmas Eve at 6:30 pm and on Christmas Day at 9:30 am. More details can be found on their website at thesevenfountains.org. Greetings of the Christmas season! Christmas is coming, the goose is getting fat! We only have two services before Iain leaves for the UK for Christmas, so let’s make the most of our time to worship together! This week we will be celebrating the Second Sunday of Advent and looking at the Angel Gabriel appearing to Mary and Mary’s response. The following week, on 15th December, we will have our Christmas service – ten days early! 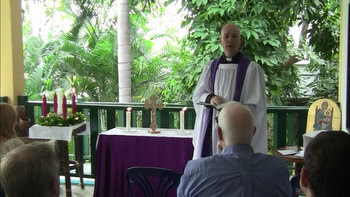 Weekly worship will resume on 5th January with our service for Epiphany. This week’s bible readings are Isaiah 11:1-10, Romans 15:4-13, and Luke 1:46b-55, and we will be singing the hymns O Come, O come Emmanuel, Angels We Have Heard on High, Let All Mortal Flesh Keep Silent and It Came Upon the Midnight Clear. After the service we will share coffee and biscuits at the house and may go for lunch at the Thai restaurant further up Pa Ton Road. Last week’s sermon can be heard on YouTube via the Audio-Visual page of the website. Directions can be found on the Where and When page of the All Saints website. Most people get to hear about us via the internet or by word of mouth, so please feel free to pass on this email to others. Last week’s offering, which was for the Philippines Disaster Appeal, was THB 5,140. This is more than four times our usual offering. 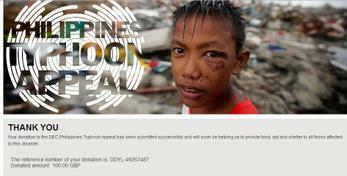 Iain has transferred £100 to the Disasters Emergency Committee Philippines Typhoon Appeal. Thanks to all who gave generously to support our brothers and sisters in so much need! Last week’s sermon can be heard on YouTube via the Audio-Visual page of the website. Iain will be away on Sundays 22nd and 29th December, and Haley and I will probably also be travelling, so there will be no services at All Saints on those days. Services will restart on Sunday 5th January. Meanwhile, we will enter the season of Advent on Sunday and will be lighting the first candle of our Advent Crown. This week’s readings are Isaiah 2:1-5, Romans 13:11-14 and Matthew 24:36-44, and we will sing the hymns O Come, O come Emmanuel, Jesus Shall Reign Where’er the Sun, Sing We the King Who is Coming to Reign, and Come, Thou Long Expected Jesus. Thanks again, to all who gave so generously.